The Beumer Group will be presenting its sustainable and energy-saving system solutions at POWER-GEN 2014 (June 3 to 5, Cologne). In particular, the intralogistics specialist will be demonstrating the function of its economical belt conveyors with the help of a model. These systems transport materials over impassable terrain in an environmentally friendly manner. Visitors will also learn about Beumer Customer Support, which ensures that all of the user’s systems have a high level of availability. 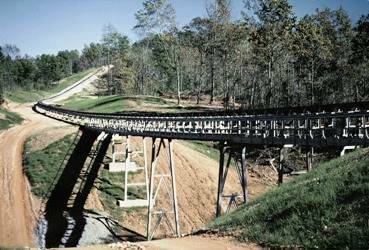 The curved conveyor systems are designed as open trough belt conveyors or closed pipe conveyors. In power stations they move large quantities of coal from storage or receiving points to the boiler and convey waste products such as ash, slag or FGD gypsum to landfills or other disposal sites. Beumer conveyor systems are also the perfect solution for conveying substitute fuels, which are coming into increasing use. Trucks have considerable disadvantages in this regard. Road building is expensive, and the more raw materials have to be transported from the excavation point to the factory, the more journeys have to be made.